Fort Wayne sits astride the confluence where the St. Joseph and St. Mary's Rivers form the Maumee River. Though occupied for over 10,000 years, its modern history begins just over 200 years ago with Gen. Anthony Wayne and his Miami nemesis, Chief Little Turtle. The pageant of Fort Wayne's history includes traders, industrialists, politicians, athletes, and movie stars. Included here are such notables as Hollywood's Carole Lombard and Shelley Long, Ian Rolland of Lincoln Life, Big Boy's Alex Azar, gangster Homer Van Meter, football's Rod Woodson, inventor Philo Farnsworth, and over 150 more. 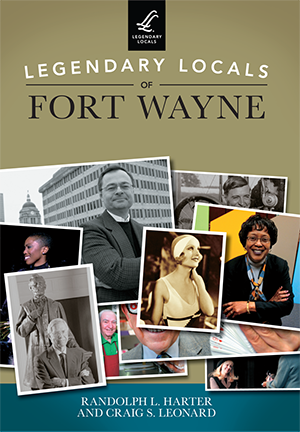 In researching Legendary Locals of Fort Wayne, the authors were granted access to the archives of the News-Sentinel, Journal Gazette, History Center, and Allen County Public Library, as well as the personal collections of many families. This is Randolph L. Harter's second book for Arcadia Publishing; his first was Postcard History Series: Fort Wayne. He is a local historian, author, lecturer, and collector of Fort Wayne ephemera. Craig S. Leonard has been a consultant in the field of historic preservation for 40 years. He is the author of over three dozen nominations to the National Register of Historic Places and has researched, written, and lectured extensively on Fort Wayne's architects and their designs.